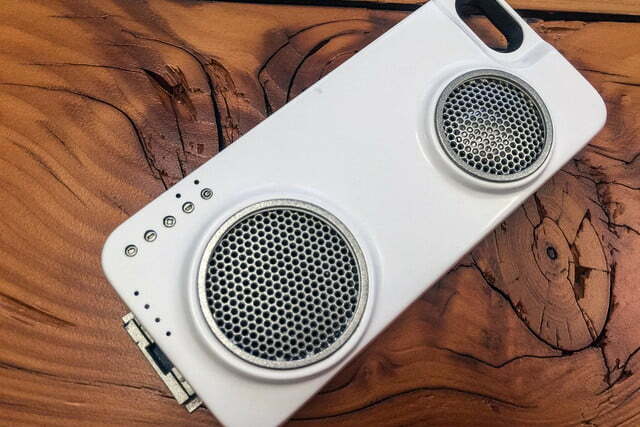 Small portable Bluetooth speakers and iPhone battery cases are a dime a dozen these days, but up until now, nobody’s ever thought to combine the two. After all, it sounds impossible. 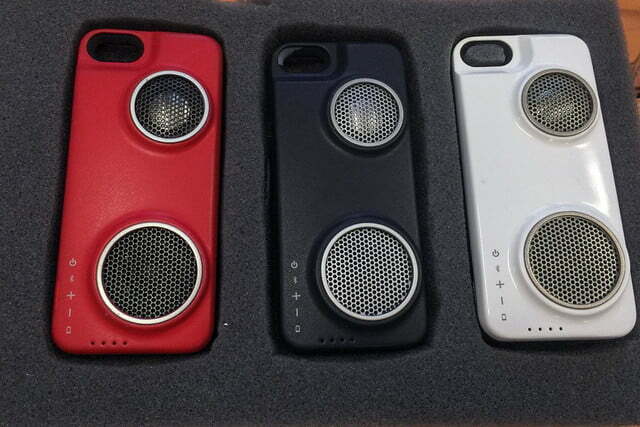 How can you possibly pack high-quality speakers and a long-lasting battery into a single case without compromising your phone’s thin profile? 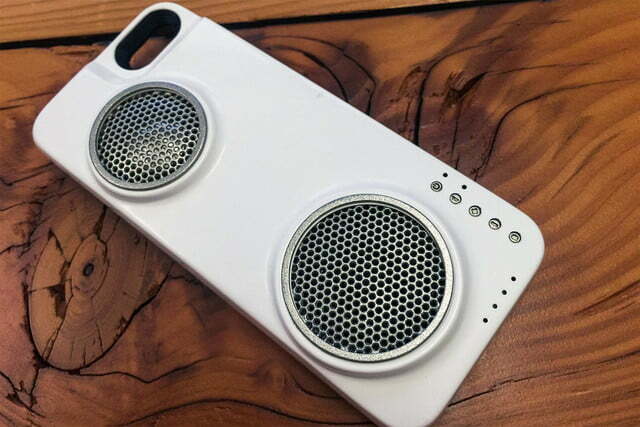 A group of high-tech engineers and music buffs got together to solve iPhone users’ two biggest problems with one case: the Peri Duo. 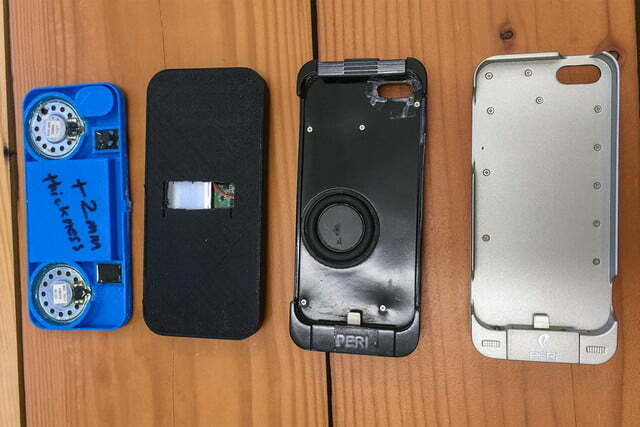 Peri recently launched an Indiegogo campaign to raise funds for the production of its new iPhone case, which will fit either the iPhone 5S or iPhone 6 when it arrives. Co-founders Cedrec Sumimoto and Michael Hsu already have a working prototype of the case, which they demoed in our New York office. The Peri Duo has retro written all over it thanks to its two big speakers and four small buttons on the front, for switching songs and controlling the volume of the speaker. But it’s not as bulky as you might think. The case doesn’t add much the overall size of the iPhone, and it blends right in with Apple’s simple design aesthetics. The depth of the phone is doubled at most, it adds only a bit of height to the device, and almost nothing to the width. 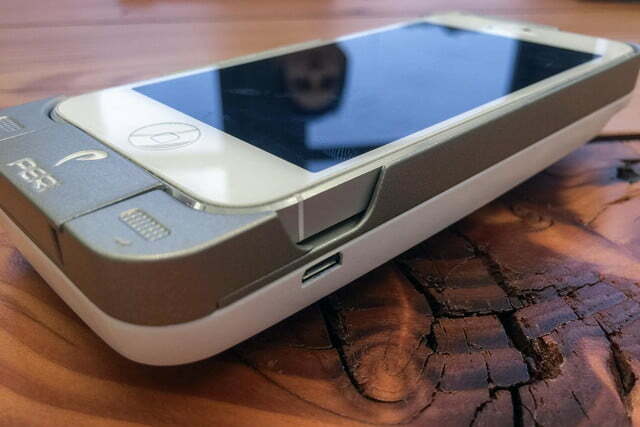 The end result is a case that looks less bulky than the OtterBox Defender series and about as sleek as any Mophie battery case you can buy for iPhone. If you don’t use the battery to charge your phone, you can use it to power 6 to 8 hours of listening time from the speakers. 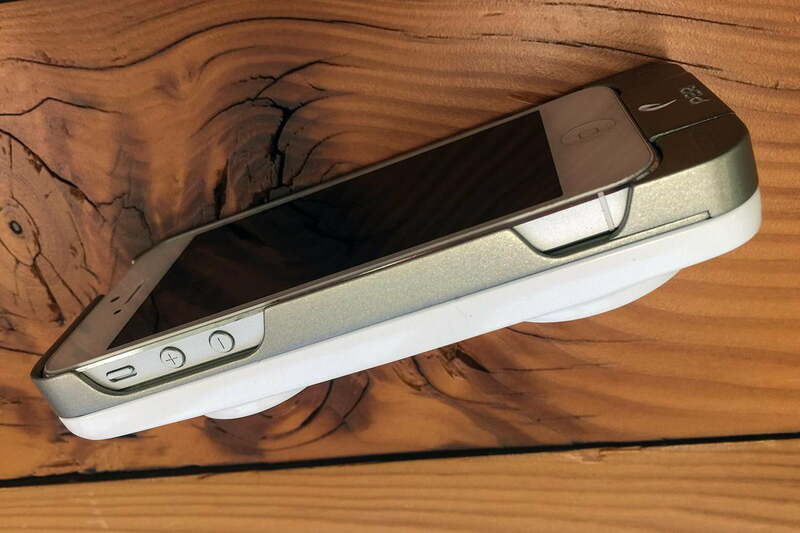 “We reduced all the electronics into a small space to fit it into a small form factor, but it still has incredible sound,” Hsu said. 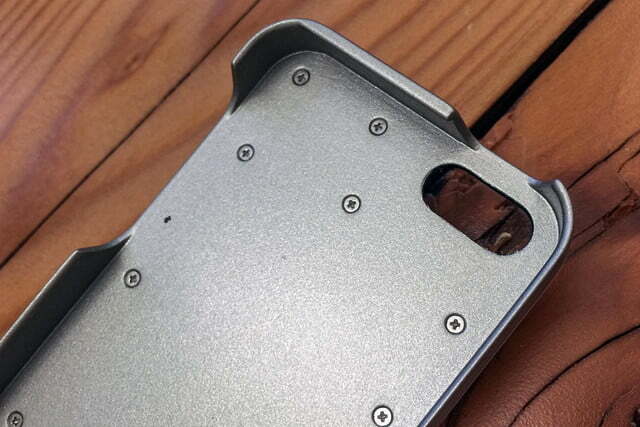 Unlike most heavy-duty iPhone cases, the Peri Duo isn’t hard to remove from its safe shell either. The team added a mechanism at the bottom of the case that you simply press and slide back to open up the case and add more wiggle room. Hsu, who is a self-proclaimed Mophie addict, said he really wanted to make sure the case was easy to take on and off, if need be. Most other cases are either too difficult to disassemble, or not durable enough to last through an entire year, he thinks. Perhaps the biggest complaint all iPhone users have is poor battery life, so Peri wanted to make sure that it solved that key problem first. The iPhone 5S Peri Duo case packs a 2,500mAh battery, which should offer a a 150- to 160-percent charge. Hsu said the iPhone 6 should get about a 130-percent charge from that battery size, but the team is still trying to squeeze a bigger battery into that case. If you don’t use the battery to charge your phone, you can use it to power 6 to 8 hours of listening time from the speakers. 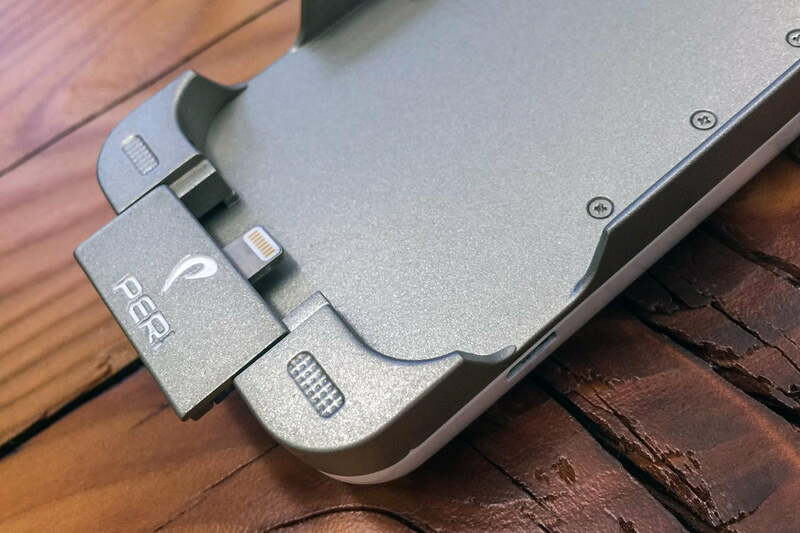 However, the Peri team expects that most users will use the case for a full iPhone recharge and then play a few hours of music. 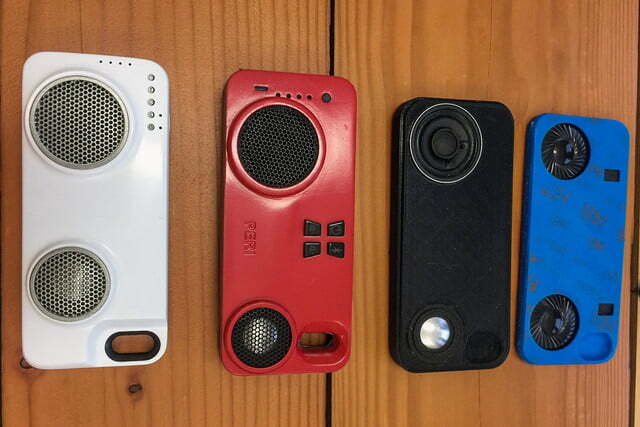 Peri’s goal was to offer Jambox quality sound from its iPhone case. 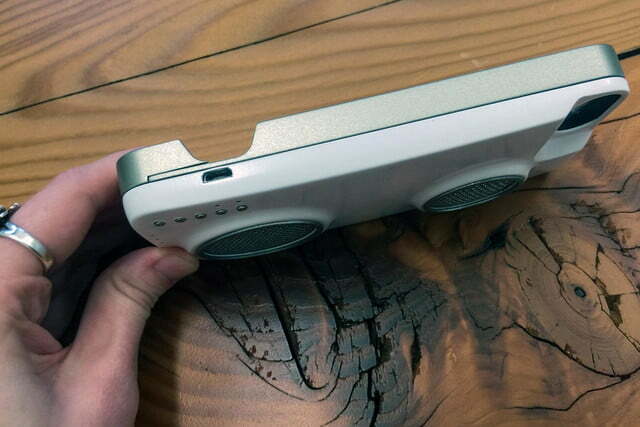 Even though the case looks slim and small, it packs an audio punch and greatly improves sound quality. The speakers have a 3 Watt driver, and are both 3 or 4 Watts. Peri says there’s also an integrated, hi-res DAC (digital-to-analog converter) and programmable single-chip audio DSP. Peri has a companion app in the works too, which will let you program the DAC and adjust equalization. 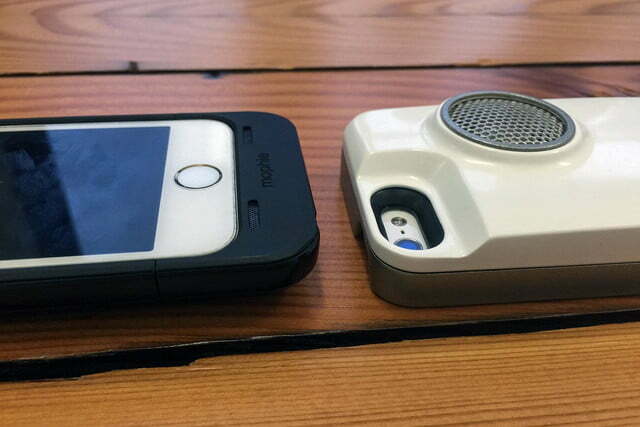 The speakers themselves connect to your iPhone via Bluetooth or Wi-Fi, so even your friends who don’t have iPhones can play their music on your device. The case can also be used to multicast music with multiple Peri Duo cases using peer-to-peer Wi-Fi connectivity. Peri says this multicast function will be ideal for parties, as well as conference calls. Accessories for iPhones aren’t exactly cheap, especially when you’re talking about battery cases and Bluetooth speakers. 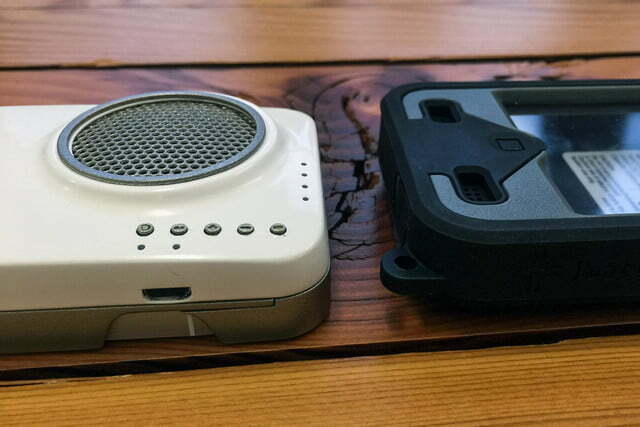 Many battery cases cost around $100, and a good Bluetooth speaker can be a lot more. If you end up buying both in addition to your expensive iPhone, you’ll have spent around $1,000 by the end of the day. 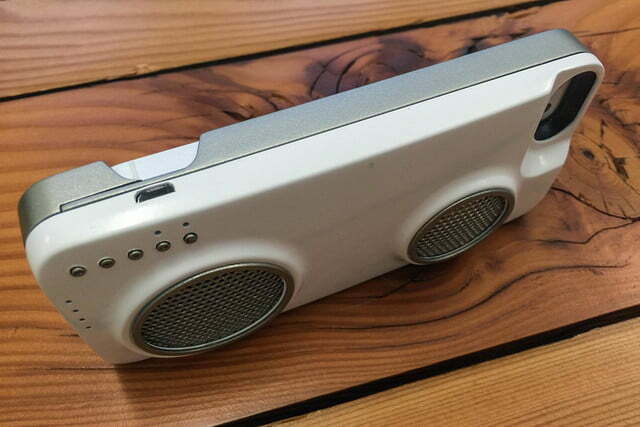 To make matters worse, Hsu says he never actually carries his Jambox with him, so when he wants to hear music out loud, he doesn’t have his speaker — It’s at home on his bookshelf. The Peri team is really only looking to fund the production of its cases because it already has a fully functional design. Peri hopes to expand to Android devices soon, too. 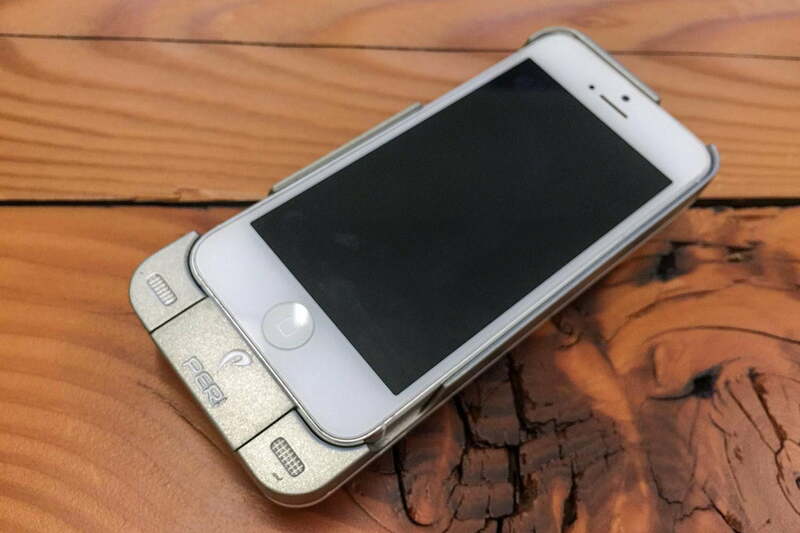 The case’s design is fully approved by Apple, and the Peri Duo is licensed with the company. Peri said its working with Apple authorized manufacturers, and hopes to sell the cases in Apple’s Stores one day soon, assuming the campaign and negotiations are successful. 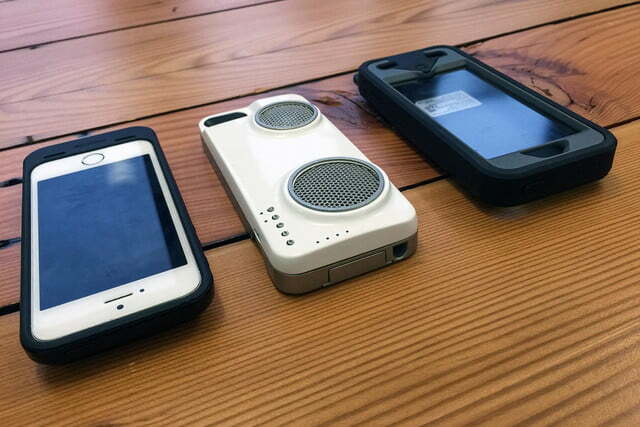 You can pre-order the case on Indiegogo right now for $80 if you catch the early bird, and $100, if you don’t. When the Peri Duo hits stores, it will cost $140.